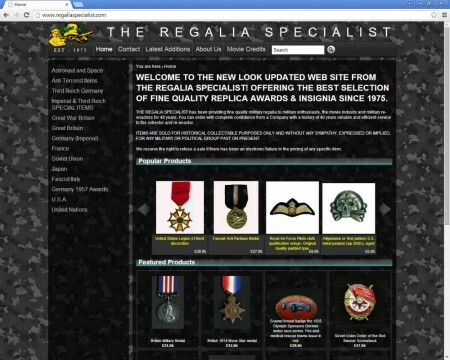 Established over thirty years ago, The Regalia Specialist provides fine quality military regalia to enthusiasts, museums, the movie industry and military re-enactors throughout the world. Another example of a long term client, the current version of the site is probably the 3rd or 4th generation, with each version being an evolution from the last, designed to encompass the latest trends and technologies. The design is pure "PG54" but the images and content are created, supplied and managed by The Regalia Specialist team, via the PG54 CMS Administration systems and processes.